New Order's Bernard Sumner is unveiling his new band Bad Lieutenant by making their first single, Sink Or Swim, available as a free download. 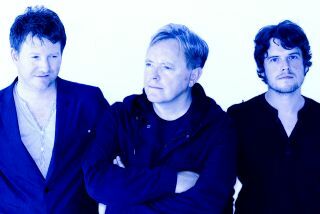 The group, comprised of Sumner (vocals, guitar), latterday New Order member Phil Cunningham (guitar) and Jake Evans (vocals, guitar), formed in 2007 and are due to release their debut album, Never Cry Another Tear, on 12 October in the UK. "This album is very important to me," says Sumner, who shares production credit with his bandmates. "We've worked hard on it and I'm proud of it." In the US, Never Cry Another Tear (distributed by the band's own Triple Echo Records) will receive a sightly unorthodox release pattern: On 6 October it will be available as a digital download through Amazon. Subsequently, for one month beginning 13 October, the record can be purchased as a physical CD via Amazon. Finally, on 10 November, the physical CD will be available at all outlets. In the meantime, you can download the single Sink Or Swim on the official Bad Lieutenant website.